Whether you’re a fan of Sushi or Mexican on a Friday night, restaurants need supplies and equipment to help them bring those tasty dishes to your table. From mixers, to bar equipment and from food prep to furniture, every successful restaurant needs the supplies that will help them serve up dish after dish. 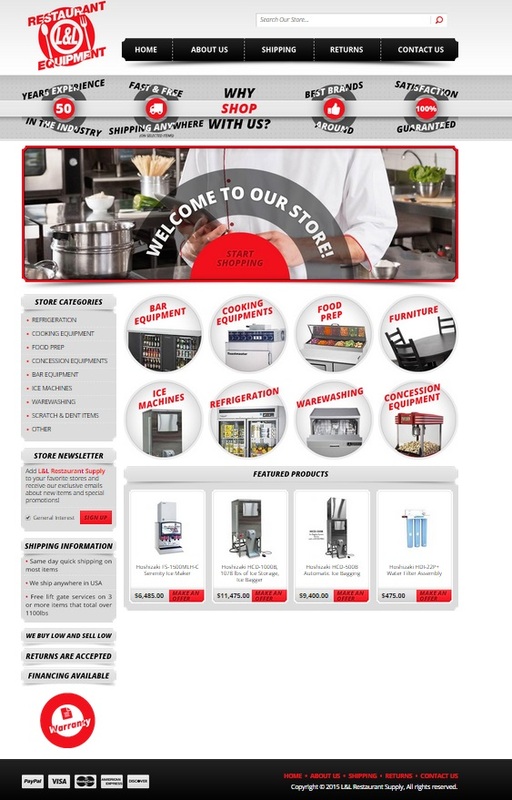 That’s why when L&L Restaurant Supply came to us at OCDesignsonline to talk about their needs for a custom Ebay storefront, we were more than happy to create one for them. We wanted those turning to L&L Restaurant Supply for all of their restaurant equipment needs to be able to find what they were looking for quickly and easily. We went with a red, black, and gray color scheme and bulls-eye unique selling point graphics to mimic the business’s logo. We’re quite happy with how the site turned out. We wanted the header to reflect the attitudes of the owners while making sure to highlight the various unique selling points offered by this Ebay store. We opted for high-contrast colors, so that we could make the different points “50 years of experience” and “satisfaction guaranteed” stand out from the header bar. We wanted to keep in style with the company’s logo, so we mimicked the shape and the font used in the company’s logo. Because the customers shopping with L&L Restaurant Supply are likely to be looking for specific items in specific categories, we wanted it to be easy for them to find what they are looking for. We created easy-to-navigate buttons with images of items in the class of product for which they might be searching. We also included categories in the left-hand side menu bar. When a customer mouses over one of the buttons, a red bulls-eye appears, with the words “View All.” This interactive feature adds some pop. We wanted to keep the same feel throughout the pages for L&L Restaurant Supply, so we used our custom eBay templates to make the category search pages and product listings consistent with the storefront page. This way, as customers browse, everything is consistent. On the product listings page, we include all of the policies for the company so that customers will be able to understand exactly what the store’s purchasing policies are. We also created a spot for the company, on their custom eBay storefront page, to list any specials they have going on and featured products. This way, customers can see at a glance what’s on sale and what’s featured as they browse through the site. Having a featured items box can also help encourage your customers to come back and revisit your page – again and again to see what’s on special. Have a restaurant supply store? Need help with your custom eBay storefront? We can help! We have a large variety of custom eBay templates to work with to help you sell your products. We will custom tailor the pages to your company’s business and logo. Let us help you increase sales with a more professional look. Contact us today for a quote. Be sure to add us on Facebook, follow us on Twitter and check out our Google+ Page too!